"O Jerusalem, Jerusalem! You kill the prophets. You kill with rocks those men that God has sent you. Many, many times I wanted to help your people. I wanted to gather your people together like a hen gathers her chicks under her wings. But you did not let me. Now your home will be left completely empty. I tell you, you will not see me again until that time when you will say, 'Welcome! God bless the One that comes in the name of the Lord (God).'" Doesn't this passage, this haunting cry of Jesus, seem very poignant even today? God longs to bless the people of Jerusalem. 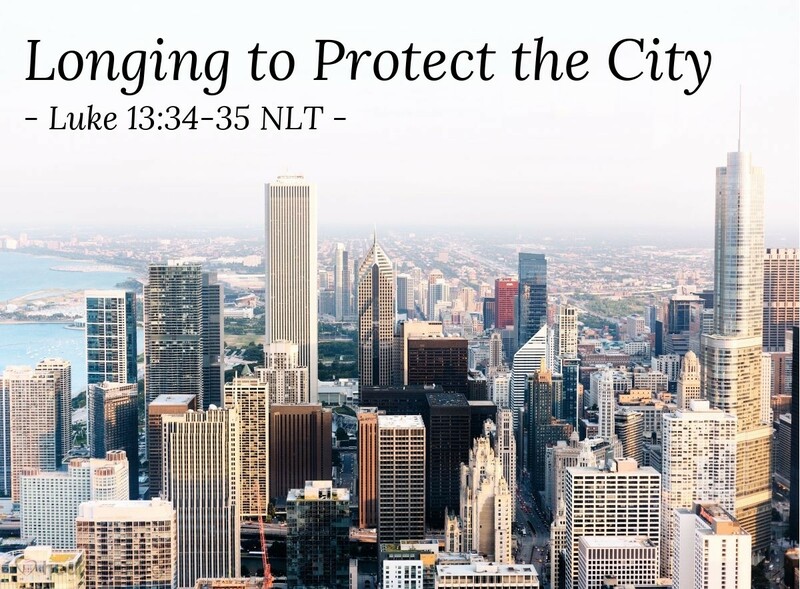 In fact, the Gospel of Luke and the book of Acts remind us again and again of God's love for the great cities of the world—Jerusalem, Antioch, Ephesus, Athens, Corinth, Rome ... and how he longs to reach them with his grace through the Gospel. Yet so often the cities, like Jerusalem which will be the scene of Jesus' rejection, reject the message of Jesus. Their rejection of God's grace, ethics, and morals ends up bringing destruction on the cities themselves. For Jerusalem, however, the rejection of Jesus is the rejection of their Messiah, their hope, and their Savior. Let's not be guilty of the same rejection. Let's understand God's desire to bring us under his wing of protection and respond by offering him our hearts, souls, minds, and strength. Tender Shepherd, my heavenly Father, thank you for your Son and my Savior and Lord. Use me to be a blessing to my city and empower me to share your saving grace given through Jesus, in whose name I pray. Amen.